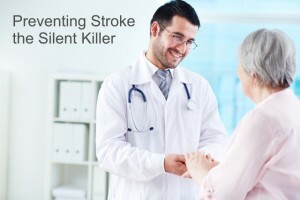 Statistics show that stroke is the third leading cause of death in the U.S. While people of all ages can suffer from it, older adults are at a greater risk. Increasing one’s awareness of stroke can help in developing a preventative plan. •	Sudden weakness or numbness in the arms, legs, and face. As a home health care service provider, we suggest some preventative measures to help in reducing your risk of experiencing a stroke. •	Lower Blood Pressure- High blood pressure puts anybody at a high risk of experiencing a stroke. In order to maintain a lower blood pressure, it is imperative to have a healthy diet, perform a thirty-minute physical activity every day, and quit smoking. Also, it is important to reduce salt consumption to less than 5 grams per day because salt can raise our blood pressure. •	Healthy Weight- Being overweight or obese can increase a person’s risk for stroke. To know if your weight is in a healthy range, consult with your doctor so he can calculate your body mass index (BMI). Also, the internet has information on how to calculate this on your own. •	Limited alcohol intake- Drinking alcohol heavily is a risk factor because it raises blood pressure and increases your risk of hemorrhagic stroke. But, moderate drinking prevents this type of stroke and helps in keeping blood free of any clots. There are many things to do to prevent a stroke, but there are a number of genetic factors which may also contribute to one’s risks. •	Age. People of any age can experience a stroke. However, the risk doubles each decade between ages 55 and 85. •	Family history. If a family member has experienced a stroke, anyone in the family is also at risk of having one. This might be because diabetes or high blood pressure is in the genes, or family members tend to have the same activities and habits. •	Gender. Studies show that men are at higher risk of stroke. However, women die of stroke more often. •	Ethnicity. African Americans have a higher risk of stroke than other ethnic groups in the U.S.
Those who survive a stroke are expected to experience many changes in their life. They often require continuous care. Colorado Family Quality Home Care, a reliable agency in terms of homecare in Aurora, Colorado, offers compassionate care to people who experienced a stroke and helps protect them from another stroke. For inquiries, please call us at 303-632-7225.